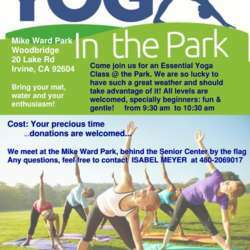 Come join us for an Essential Yoga Class @ the Park. We are so lucky to have such a great weather and should take advantage of it! For ALL levels, specially beginners: fun & gentle! Bring your mat, water and your enthusiasm! We meet at the Mike Ward Park, behind the Senior Center by the flag.